My friend Tony Caggiano mentioned recently that he could remember him and his brother anxiously awaiting the opening of Big Thunder Mountain Railroad. If you’ve spent any amount of time around the Main Street Gazette, you know that this has long been my favorite attraction in Walt Disney World. After Tony got me thinking, I went a retrieved this piece from my collection. 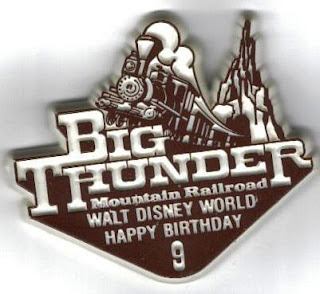 Big Thunder Mountain opened in 1980 and, as a part of Walt Disney World’s 9th Birthday, pins immortalizing the attraction in plastic were handed out. Even though it is plastic. It is a great pin.